Thoughts on History and Pop Culture from a Northern Michigan Geek. Recently I've been reading Three Hearts and Three Lions by Poul Anderson, which is about a man fighting in World War II who discovers he has another life as a famous knight in a world that resembles the chivalric romances of King Arthur and similar tales. It's an enjoyable read, and a fascinating work for any number of reasons - the both implicit and explicit Christianity, the clear antecedents for some elements of fantasy role-playing games (I believe Jeffro addressed this in Appendix N), the way the main character uses his modern knowledge to survive some of the more fantastic elements - although this last, I thought, was somewhat overused and undercut my belief in the setting, to an extent. The rationalization of the giant's cursed gold as being irradiated by the process of turning to stone was an especially bad example. Now, I've checked the Word of Jim website and have seen no definitive proof of this, but I cannot believe that Harry's ad isn't a response to Martinus'. Not just the format, but especially that last line seems to set up a deliberate dichotomy between the two. Whether this specific influence is intended, unconscious, or imagined, I would say that both The Dresden Files and Three Hearts and Three Lions are worth reading. Indeed, as a standalone work the latter is in some ways, despite being originally published in 1953, more accessible. Most of the time, out there in the wilds of the Internetz, coming across something completely flabbergasting is a negative experience. About a week ago, however, I came across something that was definitely positive, if still flabbergasting. 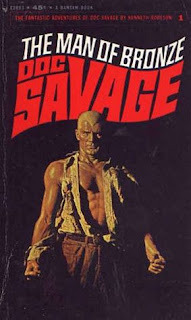 Over at the Castalia House blog, one of their periodic posts highlighting recent releases in Indie and small-press adventure fiction caught my eye with a header mentioning the Man of Bronze, a pseudonym of the classic adventure pulp science-hero and superhero precursor Doc Savage. Now, on previous occasions Castalia House has highlighted the release of the new Doc Savage stories being produced by Will Murray and Altus Press, but this case turned out to be far more interesting. the Dynamite comic adaptation cover. In fact, somebody has released about a dozen of the original Doc Savage pulp stories as Kindle e-books, for about $3.50 a pop. The publisher is listed only as "Amazon Digital Services", and the text appears to be taken from the original 1930s - '40s magazines (complete with introductory illustrations), though the covers are the classic James Bama pieces from the Bantam paperback editions of the '60s - '70s. With the sole exception of Doc's introductory adventure seen here, none of the specific titles are ones that I'm familiar with. On the strength of The Man of Bronze, however, I'm perfectly willing to recommend them to anyone interested in stories of adventure and heroics. However, I'm still curious as to how exactly this cornucopia came to be. I'm pretty sure that Doc is not yet in the U.S. public domain (Steamboat Willie is older), yet besides the Castalia House piece I can't find any other references to them. They're not from Altus or the Radio Archives people, as far as I can tell, and I'm not sure who would own the copyright on them anyway. Conde Nast? The price seems way too reasonable to have been set by any major publisher. 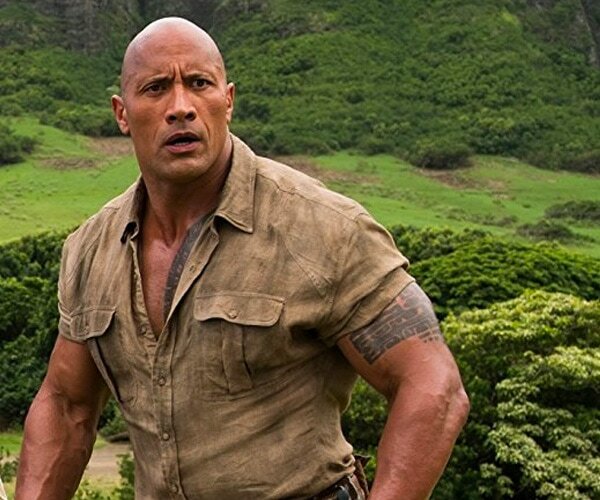 Maybe it's a stealth marketing campaign for the rumored upcoming Doc Savage movie starring Dwayne "The Rock" Johnson. CAN YOU SMELL WHAT THE DOC IS COOKING?! 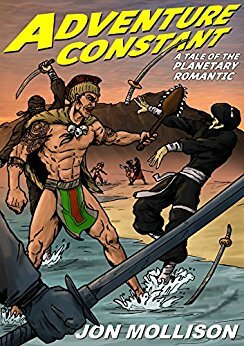 In any event, whether the rest of the 100+ Doc Savage stories are going to be hitting Amazon shortly, or whether these are actually pirated editions that will shortly be yanked, this is a great low-investment way to check out the original tales of a key figure in the history of pop culture. So What Is This #PulpRevolution, Anyway? By now, regular readers of this blog will have noticed several posts using the #pulprevolution tag, and might be wondering what I mean by that descriptor. 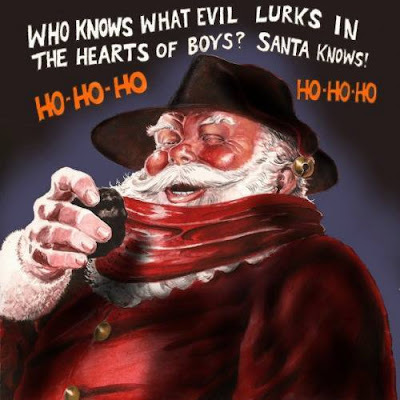 Happily, author J. D. Cowen has just made an excellent blog post that recaps the last several years of rediscovery of what pulp fiction really means. "Of course, pulp fiction has never fully gone away. But that isn't without lack of trying. 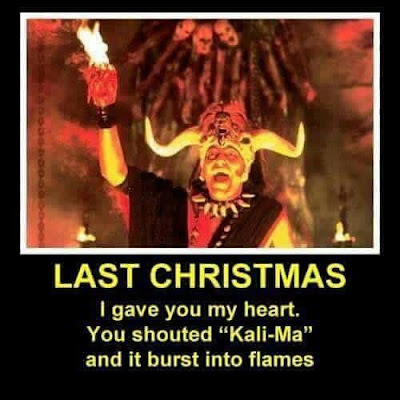 It has been used as little more than an insult or a cheesy aesthetic for those who hated them. It has been used as an insult by those who never bothered to read the original works. Pulp became a synonym for trash, and nothing else. The Tarantino movie didn't help. The tradition of genre fiction actually goes back through the pulps and the penny dreadfuls all the way to at least Poe. By ignoring the pulps you are cutting the line of tradition and thumbing your nose at it. Those who trash it have no idea what they are actually doing." The post compiles a lot of the discussions, videos, and controversies of this movement to date (including one of the most objective takes on the whole Sad/Rabid Puppies Hugo Awards thing I've ever seen), making it a valuable resource for those interested in improving their writing craft. And though it's only been a few years in the making, there's already been progress made. Jeffro Johnson recently had cause to give a quick sketch of some of the standout authors in the movement, a few of which have been mentioned here before. 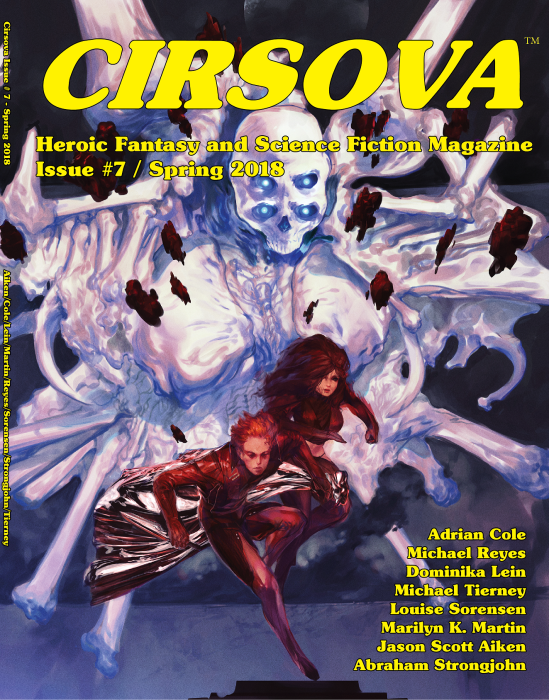 If we can take it for granted that the past forty years has been a veritable Dark Age for science fiction and fantasy, then having P. Alexander’s Cirsova magazine has been an absolute godsend. Has it come close to the very best of the Weird Tales era? No one that I know of has argued that. But I believe he can go toe to toe with some of the better works in Andrew J. Offutt’s Swords Against Darkness series. More recently he has managed to go further and acquire stories that are on par with the better efforts you could find in Planet Stories. You’d rather have the next H. P. Lovecraft? 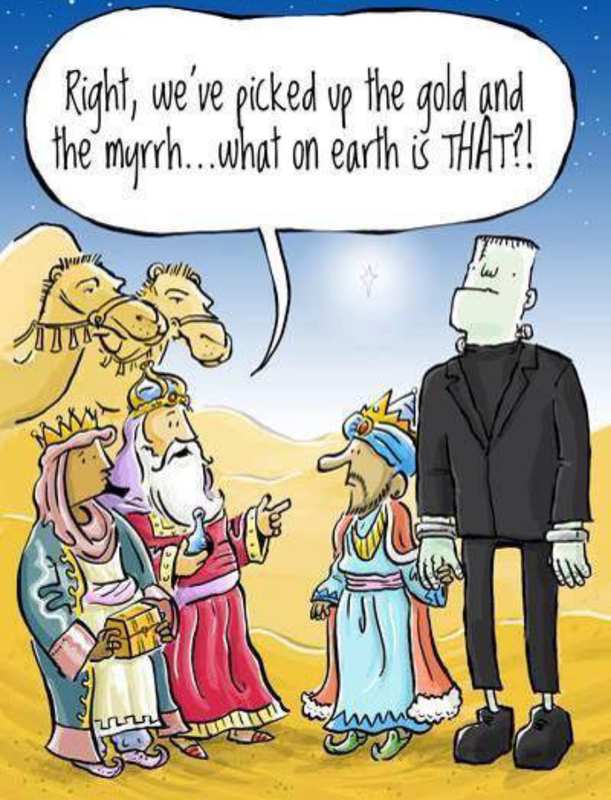 Well maybe he hasn’t arrive yet. But Misha Burnett‘s New Wave style handling of the Great Old One’s oeuvre sure did manage to raise the bar on what I expect today’s short fiction authors. Who has managed to capture some of the more thrilling qualities of Jack Vance and Robert E. Howard? Schuyler Hernstrom, hands down. 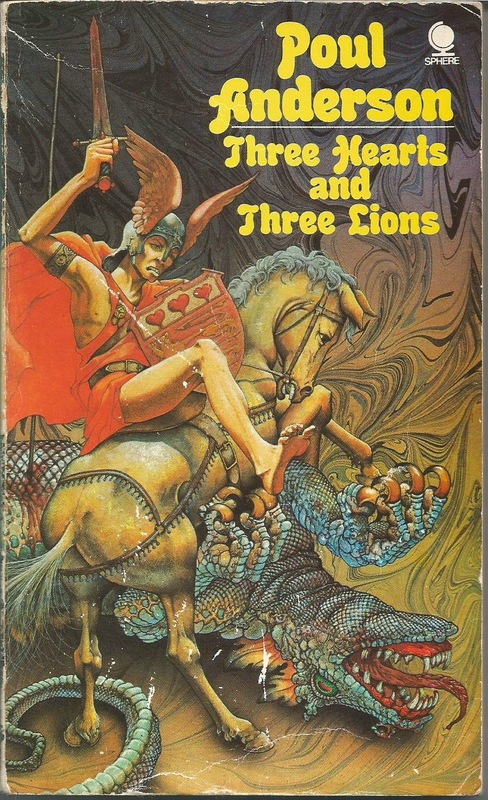 Who has succeeded in imbuing his stories with the more compelling aspects of Lord Dunsany, C. S. Lewis, and 1930s space opera? John C. Wright. Who has diligently applied himself to reclaiming pulp era heroism and romance? Jon Mollison. Who has gone from making a work comparable to a short Andre Norton novel to recapitulating the fire of an early 1940’s Leigh Brackett? Dominka Lein! While I haven't read everything by every author on that list, Cirsova magazine, John C. Wright, and Jon Mollison have all made appearances, to much-deserved praise. And Jeffro modestly neglects to mention his own Appendix N, which as J. D. Cowen noted above deserves a great deal of credit as a catalyst for the movement. But you don't have to take our word for it - lots of these author have free works available on their websites (many of which are in my blogroll) or for their newsletter subscribers. 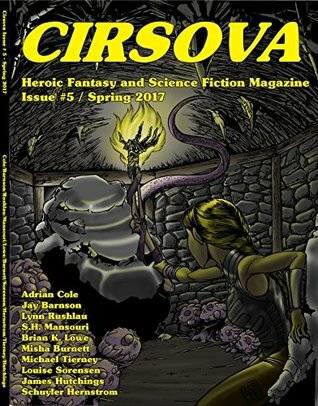 And speaking of Cirsova, this week the fifth issue is free on Amazon Kindle - it's a great example of some of the ideas being thrown around in the Pulp Revolution (especially considering it has a story by Schuyler Hernstrom taking place in Misha Burnett's Eldritch Earth setting, and it's one of the highlights of the issue, too!). Possibly the most astounding thing about the Pulp Revolution is the way it's expanded over only a few short years. If you're a fan of science fiction and fantasy and have felt that recent mainstream offerings lacked something, now's the time to dig in and try something new - the only place to go from here is up! OK, now that I've given author Jon Mollison grief a couple of times over the cover of his novel Sudden Rescue, I probably ought to mention that it's really a pretty good book. In fact, last summer was something of a breakout season for Jon, and so far I've picked up three of his novels and thought them all great reads. I still say he looks like Luigi. 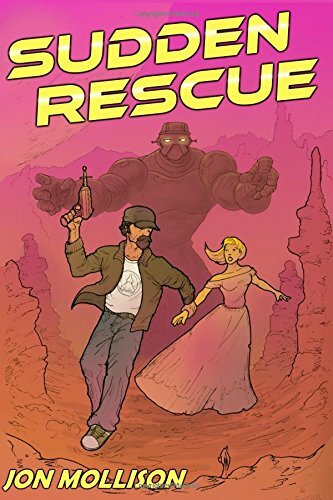 Sudden Rescue, released just under a year ago, starts with an archetype we're all very familiar with, the independent space hauler who's not afraid to shade the finer points of smuggling law. Captain E. Z. 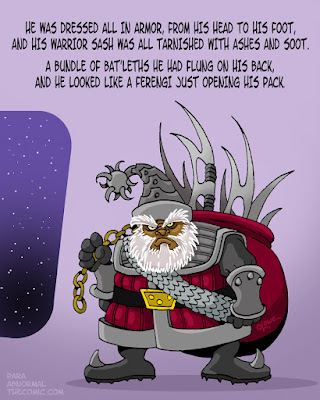 Sudden would be right at home with the likes of Han Solo and Malcolm Reynolds, dodging space pirates and overbearing AI empires until he is suddenly thrust into galactic politics with the recovery of some lost cargo containers, one of which contains a member of the local space nobility named Karenina. When it is revealed that she was on her way to a wedding that could make or break the human alliance against the aforementioned AI, she and Sudden must embark on a journey through treacherous peril and exotic, imaginative locations to stop a terrible war. The next novel, and probably my favorite of the three, is Adventure Constant. This one uses travel to parallel dimensions rather than space, postulating a world where the physical laws of the universe encourage swashbuckling and derring-do. I suspect Jon especially enjoyed the world-building on this one, what with the Panama Canal becoming a lizardman-infested suicide run, Hawaii still an independent kingdom, and the US equivalent run by an office called the Autocrat of Liberty, the current holder of which is described as a "bombastic business tycoon who had rallied the common man to his cause and was even now attempting to roust the cancerous elitists and their foot soldiers from the country." OK, that last one probably didn't take much imagination. As a crossover enthusiast, I also need to mention the couple of times that Jack Dashing, the hero from our world transported via crashing rocket to this new one, makes a literary reference only to discover that he's accidentally talking about real people. When this happens to the Three Musketeers it's kind of understandable, since half the characters in that work were real people anyway, but when Jack mouths off to a British spy about his 00 number, he barely manages to get the words "secret agent named James -" out before the spy is question goes from demanding where he heard that to ranting about fraudulent poster boys. With his next release, Jon Mollison returns to the stars with the aptly named Space Princess. 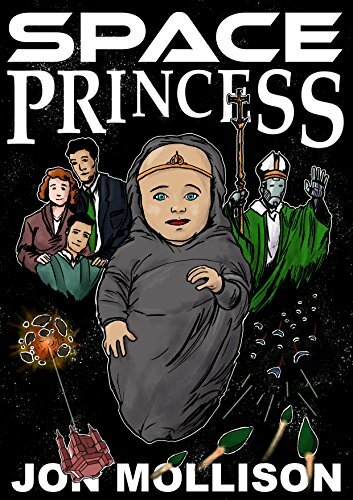 In this case, however, the princess is an infant, rescued by a fairly standard American Catholic family and caught up in the political intrigue and space combat that naturally follows. Jon does a neat trick here by making a setting that shares some broad similarities with that of Sudden Rescue - both are interstellar monarchies - but is quite individual at the same time. In fact it reminds me a bit of a lighter and softer Warhammer 40,000, what with all the cathedral- and chapel-shaped ships being used by the Space Catholics (the red crescent fighters and minaret-bedecked capital ships of the Holy Terra-threatening enemy weren't terribly subtle, either). But the best part is the way in which the ordinary family rises to their very un-ordinary circumstances. In a way, (and given a flexible definition of "ordinary") that's something that all three of these works have in common. In addition, of course, to being fun, adventure-filled works that rest on sound Christian principles without being preachy. The heroes are all heroic, in every sense of the world, and their sense of optimism makes a fine alternative to the too often nihilistic spirit present in many SF works today. One of my blogging goals for 2018 is to revisit and hopefully cap off some of the series of posts that have been left hanging in previous years. 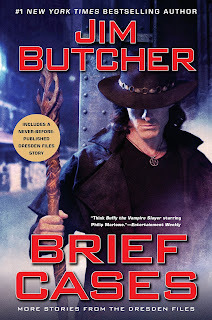 Of these, the most egregious is my planned re-read of the Dresden Files series by Jim Butcher, which spluttered out before I even got to the first novel. There are now fifteen novels in the series, along with the various short prose and comic-book stories, and while the release date for the sixteenth has not yet been announced, this summer will see the release of the second short story collection, Brief Cases. Whatever the real-life circumstances that have delayed Harry's adventures, at least we know Jim hasn't lost his touch in coming up with snappy titles. I’m sure it’s just one of those freaky coincidences. Tweed-clad old smiling ‘creator of worlds of imagination’ Ronald Reuel, Summer Knight of the Seelie Court does not look a thing like Tolkein. Or, uh. Well he does, yeah. On the other hand his statements that Justin DuMorne, Harry's guardian, was absolutely, no-questions, "D-E-D dead" (which I take as evidence that Harry's mentor is still alive*) are available, although I had a bit of trouble finding them since I was initially using "DuMorne" as my search term. Truth be told, some of the pages could use a bit of subdivision. As we mostly-patiently wait for Brief Cases, as well as the next two novels, Peace Talks and Mirror, Mirror (which will be about exactly what you're thinking), I anticipate that Word of Jim will become a well-used resource by the Dresden fan community, and I thank the compiler "Serack the WoJ Guru" for his efforts. *OK, here goes. Some years before gaining guardianship of the young Harry Dresden, Justin DuMorne was, by all accounts, an exemplary Warden (The Dresden Files' version of a wizardly police officer), who was involved in the takedown of a dangerous necromancer named Kemmler. Immediately after Kemmler's seemingly final demise, however, he absconded with a dangerous artifact (the yet-unnamed Bob the Skull) and, later, trained Harry as a wizard without any of the usual ethical instruction. Later Harry encounters a bunch of Kemmler's old hangers-on, including one with the charming nickname "Corpsetaker", who specializes in tactical body-swapping. My theory, then, is that during that last battle Justin DuMorne was the victim of a similar body-swap initiated by Kemmler, and thus was killed in the necromancer's body while his own identity was stolen by Kemmler. Thus, DuMorne is, as Jim points out, as dead as Kemmler, in that they both half are and half aren't. Of course, if Jim never brings Kemmler back to face Harry again they might just as well be all dead, but at this point in Harry's career a legendary necromancer with the face of his hated guardian is just the sort of enemy he might encounter. And I have my suspicions about the mysterious figure called Cowl . 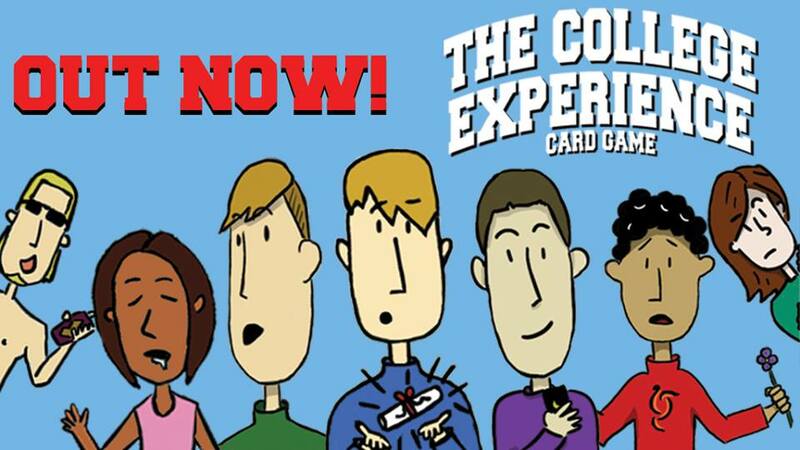 . .
Kickstart Your New Year With Card Games and Adventure Fiction! Happy 2018 to all my readers! As I do from time to time, I'd like to start this year of blogging off by highlighting a couple of crowd-funded projects I'm following. 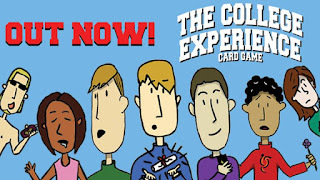 The first is a card game called "The College Experience", put together by some folks in Grand Rapids, Michigan. Now, I have to admit a little bias, here - the artwork for this game is done by a very dear friend of mine, through whom I was able to get access to a play-testing copy. While not particularly complex, as a pickup game for a spare half-hour or so it does it's job well, especially in the endgame when the players are getting a little more desperate to fill one of the two victory conditions (either holding the "Diploma" card when the draw pile runs out or, in one of the games more elaborate jokes, getting all three of the other highest value cards at any one time. These three cards, of course, represent Good Grades, Enough Sleep, and your Social Life). With just a single day left in the campaign, the game has raised nearly 30% more than its original goal, which is a victory condition in itself. 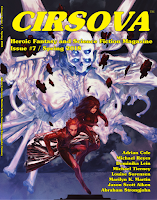 Also crowd-funding this month - although it's really more of a subscription drive, the goal-meeting aspect is something of a formality, given the circumstances - are the next two issues of the excellent pulp fantasy and science fiction adventure magazine Cirsova. The magazine has apparently been doing quite well for itself, since the two-issue digital subscription is a whopping $1. With the back issues going on Amazon for about $3 each (for Kindle Readers, of course, the physical copies are more costly no matter which way you buy them), the magazine is practically being given away - and, if you still need convincing, most of the first three issues are literal giveaways at the magazine's website. But don't delay too long, the subscription is only open until the end of the month! No matter if you're a reader, a gamer, or both, there's nothing quite like helping someone else fulfill a creative dream. Although the technology is only a few years old, it's amazing the kind of things that can be produced by crowd-funding. Both of the projects I've mentioned here have met and exceeded their initial goals, and I hope the successes of these projects inspire their creators for a long time to come. 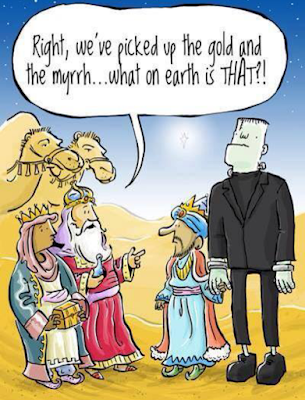 Merry Christmas and Happy New Year to all my readers - may they be filled with the love of Christ and the joy of family (and of mashup art)! THE IRON GIANT: OF ALIEN DESIGN OR HUMAN INGENUITY?